In the video game Homefront, shortly after Kim Jung-il dies, his son Kim Jong-un gives a fiery speech and mobilizes the military. In real life, the manga-reading, video game-playing successor appears less fiery—though he does resemble a Dragonball villain. The Great Successor, who is the world's youngest head of state, is like his father in more than just the military outfits he wears and lineage he bears. For the past month or so, Kim Jong-un has been going around North Korea and doing something very important. Kim Jong-un has been looking at things. 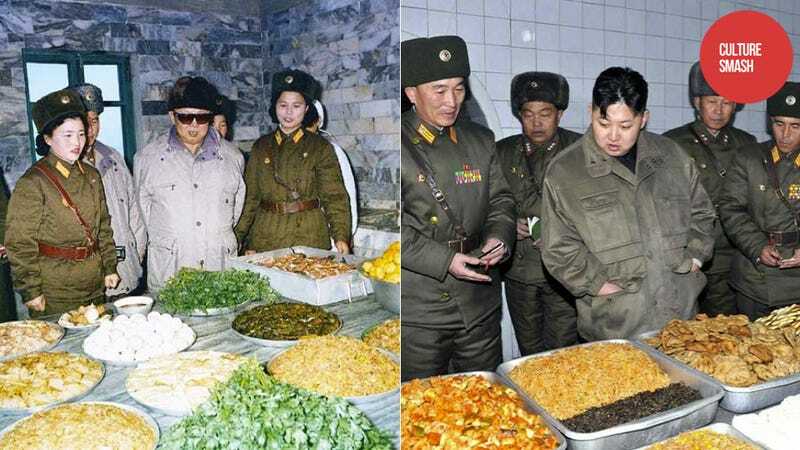 If you are not familiar with the wonderful Tumblr site Kim Jong-il Looking at Things, boy, oh boy, are you missing out—missing out on a steady stream of photos of the late Generalissimo looking at things, like tissue packets, tanks, rope, and soda pop. These recently released photos from North Korean state media are vastly different from the slim, handsome young leader Homefront originally portrayed. More than that, the photos show Kim Jong-un looking at things. As reader netwizard2003 pointed out, there is already a Kim Jong-Un Looking at Things Tumblr. Thank goodness! Kim Jong-un is only 28, and there's still so much for him left to learn and look at.